At the recently concluded Creatives Expo organized by the British Council, a panelist for discussions on digital marketing mentioned that the ever popular Linda Ikeji blog site rakes in a cool N1.5m monthly from AdSpace and other clients. I’m not sure how true this is, I would probably say it is possible the blog clocks that amount in revenues in a good month, but I would probably guess a good monthly average would not be anything less than N500,000. Now even at that, it’s amazing how much the Nigerian online community has grown…in value! Online marketing is no longer something a brand custodian should thumb their nose at since so many Nigerians are increasingly being exposed to that platform. Study the data above. 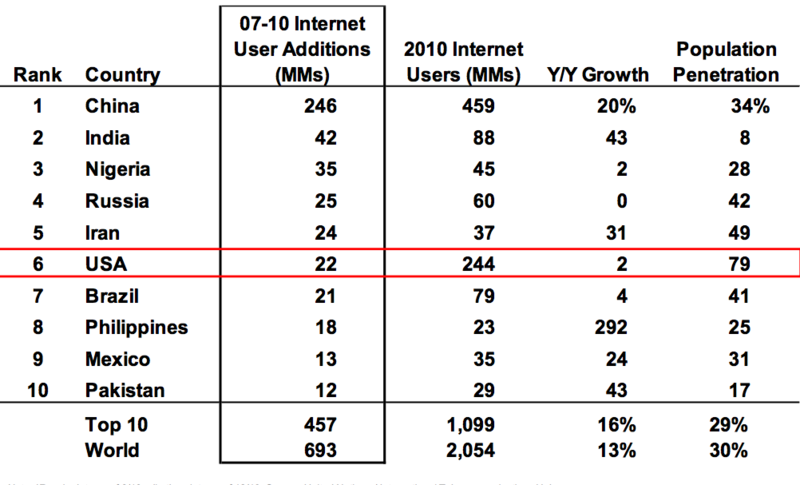 Essentially, Nigeria ranks below only China and India for YoY growth in terms of addition of internet users. Wow! Even more exciting I think is that this study reckons 28% of our entire population is now online. That’s 42 Million. That’s more than the ENTIRE Canadian population. If I were a brand custodian right now, I’d be thinking how do I capture 42 million Nigerians that are internet users? What are they doing online? Which sites are they frequenting? Why and for how long? Can your brand enter their online conversations? Don’t just do a facebook ad, how do you seep into the internet conversation? The one’s who’ve figured it out, (as well as Linda Ikeji) are the ones smiling all the way to the bank.